BOSTON, MA--(Marketwired - September 27, 2016) - Even though the United States remains the dominant innovation hub for wearable electronics, a number of other countries have emerged with varying degrees of specializations, according to Lux Research. 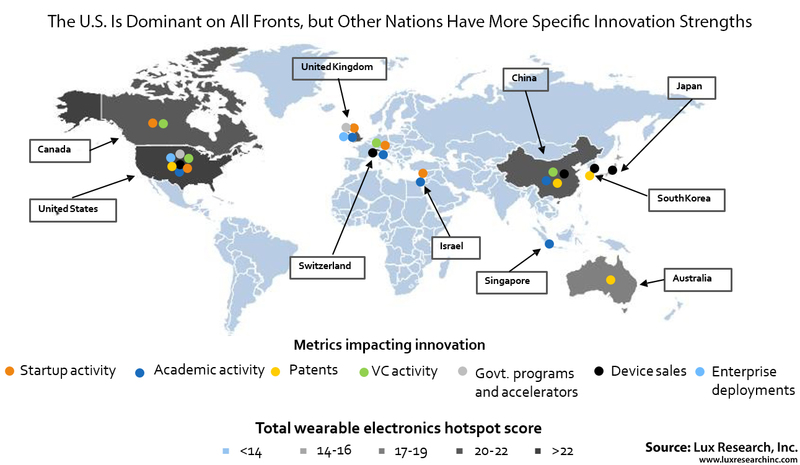 "As the wearables field matures, countries look to specialize and become leaders in the development of specific wearable form factors or applications," said Noa Ghersin, Lux Research Analyst and lead author of the report titled, "10 Global Hotspots for Wearable Electronics Innovation." "Canada, for example, dominates smart textiles, and Australia focuses on sports," she added. Grants, accelerators bolster U.S. strength. The U.S. is dominant in all aspects of wearables innovation, but its most unique strength is in government grants and accelerators. The country has five accelerators dedicated to development of wearables, and a dozen government grants to support wearables for health, safety and communication. Switzerland builds on tradition. Switzerland ranks second on the strength of its ability to leverage its historic strength in watchmaking to work on novel smartwatches. The third-ranked U.K., on the other hand, stands out for its diverse pool of institutions, companies and organizations developing wearable technologies in applications including disease management, military operations, employee wellness and fashion. Chinese startups pull in significant funding. China, ranked fourth, lacks as many startups as the U.S., but its startups receive the most venture capital on average led by a top five of Codoon, ANTVR, Beijing Baofeng Mojing Technology and Huami, each of which has received over $35 million. The report titled, "10 Global Hotspots for Wearable Electronics Innovation," is part of the Lux Research Wearable Electronics Intelligence service. The U.S. is Dominant on All Fronts, but Other Nations Have More Specific Innovation Strengths.